RF vector network analyzer provides all the performance and productivity features to simplify and speed your component measurements in the 30 kHz to 6 GHz frequency range. Its new processor makes measurement and data-transfer speeds up to seven times faster than the previous model (8753D or 8753C). Overall throughput is enhanced by new features such as simultaneous four parameter display and adapter-removal calibration. An integrated, synthesized source provides up to 10 mW of output power (100 mW for Option 011), 1 Hz frequency resolution, and linear-frequency, log-frequency, listfrequency, CW, and power sweep types. Three tuned receivers allow independent power measurements or simultaneous ratio measurements over a wide dynamic range of 105 dB at 6 GHz (with Option 006 frequency extension) or 110 dB at 3 GHz (standard). The integrated test set allows you to measure transmission and reflection characteristics of a device to 6 GHz, without a frequency doubler. 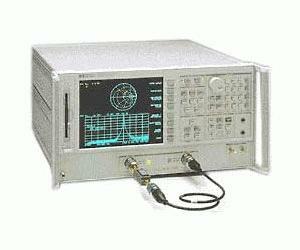 The 8753E network analyzer features two independent measurement channels. You can choose to display any combination of reflection and transmission parameters, in magnitude, phase, group-delay, Smith-chart, polar, SWR, or time-domain formats. Softkeys let you quickly access measurement functions, and you can view results in overlay or split-screen format on the LCD color display. Built-in S-parameter test set provides complete forward and reverse measurements, allowing you to characterize your component with a single connection. Superb accuracy. Comprehensive calibration guarantees accurate measurements. TRL/LRM make calibration in noncoaxial environments easier and more convenient. Mixer testing. Quickly and easily characterize frequency translating devices such as mixers. Add swept harmonic measurements. Characterize amplifier parameters ? gain, 1 dB compression, match ? and 2nd and 3rd harmonic distortion with the same test setup. Built-in 3.5 inch floppy disk drive provides convenient storage of instrument states and data. Parallel and serial ports provide interfaces to popular printers and plotters. The parallel port can also be used as a general I/O bus, with user controllable TTL inputs and outputs. Users can also connect a DIN keyboard to speed up entry of titles, labels, or file names, and for remote front panel operation. BRL Test - We absolutely know Agilent/ Keysight 8753E's. BRL Test won't be beat on price or repair turn around time. Sales and repairs 407-682-4228.